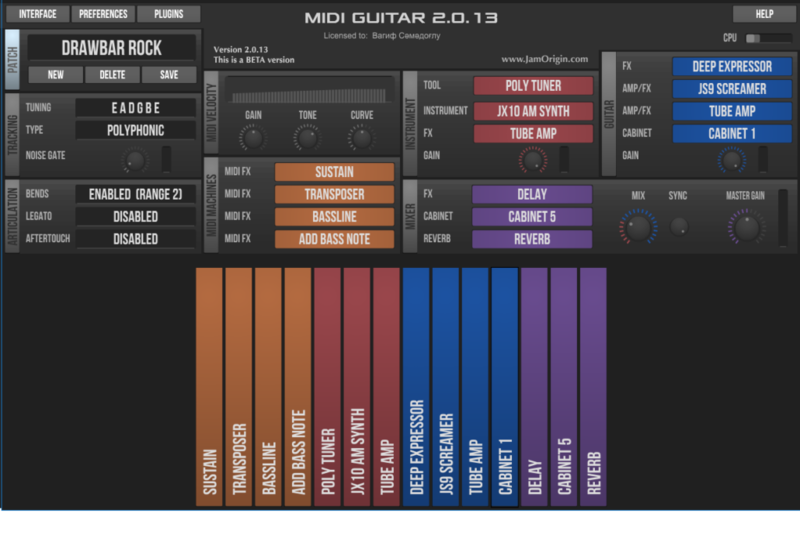 MIDI Guitar / MIDI Bass is a great little host, for making patches of any combination of Audio- and MIDI effects. It can host most 3rd party plugins: synths, effects, samplebanks and impulse responses which make up Patches, that can of course be saved and loaded again with the press of a button or pedal. You can plug it right into your DAW for seemless integration or use it standalone for live performances. To get you started, it comes with a complete set of modules built in: mostly everything that you will expect from a guitar/amp/effect rig, plus some new things that you probably never thought would be possible. This page list all modules are built into the latest desktop/plugin version of MIDI Guitar / MIDI Bass. State of the Art – Polyphonic, low latency and super responsive. State of the Art – Monophonic but very responsive. Accurate simulation of the 12AX7/ECC83 triodes for classic warm guitar tube sound. Billions of amp cabinet models are built in. You can generate cabinets that are similar to any other, or completely random. A small sampler is built in. Any SFZ sample bank will be listed as a virtual instrument. Piano instrument in a tiny footprint. This is the first of our Deep series of guitar effects. It’s also the worlds first guitar effect based upon deep machine learning & A.I. Its a very versatile effect that give you deep control over the guitar dynamics in ways that has never before been possible, including: sustain without compression, compression pr. string, transient/pluck control, clean hex distortion and direct harmonic access via drawbars! Screamer effect modelled after the iconic green screamer pedal. Add live bassline backing along your guitar playing. Transpose any number of octaves or semitones, optionally only for notes played strongly or when holding a pedal. Add classic piano type sustain or use a pedal to hold a chord and switch over to the guitar channel. Monitor what’s actually coming out of MIDI Guitar/MIDI Bass or any other MIDI source. Play any 3rd party synth or instrument in standard VST, AudioUnit formats. Or load any SFZ sample bank directly as an instrument. Any amp or effect plugin in standard VST or AudioUnit formats. Load any Impulse Response for high quality reverbs and cabinet responses. Create your own MIDI Machines with the built in Lua programming editor. Comes as standalone application and VST plugins in 32bit and 64bit formats. Hardware requirement: intel i3/i5/i7/m3/m5/m7 CPU or AMD equivalent. Complex patches needs a fast CPU. Comes as standalone application, VST and AudioUnit plugins. Any Mac produced after 2007 should be ok. Complex patches needs a fast CPU. Any Apple device running iOS12 or above will work. Please mind, not all features are available on iOS and the update release cycle is slower for iOS than desktops.